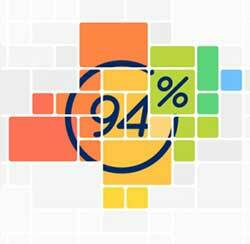 Walkthrough of 94% Things You Can Dilute Answers for every question in 94 percent game cheats. If I say Las Vegas and show you a picture of blue suitcase on beach with signs, what comes to mind first? think some words that words associated with questions that will cover 94 percent of the given answers ! The 94% Las Vegas answers “USA” and “Weddings” answers should be changed to “Fun” and “Nevada”.